J.R.Evangelisti has written novels and screenplays in a variety of genres, to include comedy, mystery and science fiction(post-apocalyptic dystopia). Jessica’s Footprints is a science fiction novel written by J.R. Evangelisti. As a 17-year-old, Jessica Bethany found fossilized footprints in New South Wales that were a revolutionary discovery. Dr. Zimmerman was there when she found them. Twenty years later, Jessica Bethany holds doctorates in ethno-archaeology and mythology. She’s also in demand as a speaker in Roswell on her past experiences and her belief in extraterrestrial life. Her friend, Dr. Samuel Benjamin, is concerned, however, about the state of Jessica’s mental health. She seems to be under some kind of stress and is experiencing dreamlike states where she finds herself dancing. When she gives a mathematician a complex formula that goes beyond the understanding of the leading mathematicians, she sets off a governmental hunt. J.R. Evangelisti’s science fiction, metaphysical novel, Jessica’s Footprints is highly imaginative and very moving. I loved the southwestern venue, especially the parts of the story that concern the Navajo medicine man and Tribal Officer Tom. Evangelisti’s characters are well-presented, and there’s plenty of action and adventure. While some gentle jibes and jokes are presented at the expense of the more radical Roswell set, this story will appeal to anyone who’s ever wondered about Roswell, ancient astronauts and the origins of our knowledge base. There’s also the mystery behind Jessica’s assertion that the footprints she found were not from an alien life-form which is in direct contradiction to the testimony of her mentor, Dr. Zimmerman. Jessica’s Footprints is a lot of fun to read, and it gives the reader lots of desert skies and landscapes to enjoy, as well as lots of things to think about. It’s highly recommended. Jessica’s Footprints begins with seventeen-year-old German Jessica Bethany from Texas, who goes on a field trip with Dr. Wilhelm Zimmerman and finds footprints which garner her international fame for her discovery in Australia’s Lake Mungo. Flash forward twenty years to Dr. Jessica Bethany, who holds a doctorate in ethno-archaeology from Vienna and in mythology from Harvard. She is in New Mexico as a guest speaker and there is great controversy about her findings as the footprints were first thought to be the oldest human prints ever found - two million years old - but Jessica claimed that it was a miscalculation that has been corrected to be only twenty thousand years old. Dr. Wilhelm Zimmerman is at odds with the claim and Jessica, as he argues that it is not a miscalculation, but the truth that he asserts Jessica is hiding. Jessica starts acting strange and attracting the notice of government officials who want to suppress her new findings of a unique mathematical program. No one knows where she got it from and suspicions and evidence arise that it’s sent from above. Author J.R. Evangelisti writes this fast paced novel with skill and riveting incidents about various people, weaving all into an intricate plot that has readers guessing and wondering. Slowly, like chess pieces moved on the chess board, things and events start making sense to readers, and more clues are brought forward to conclude in a sensational finale. The reader is engrossed every step of the way, being inspired by what is possible in this world and what is possible in the celestial universe. An enjoyable and fun read! Jessica was a respected archaeologist who had earned her place in the world of science and became popular at an early age after she made a very rare discovery. Jessica's current projects was exploring dreams, but she was having problems of her own as far as dreams were concerned. Out of nowhere, and in the middle of the day, Jessica would enter a dreamlike state and lose touch with reality. The situation started escalating further and further and, on more than one occasion, she would feel a strange presence, hear drums, and then start dancing, irrespective of where she was. Working with a dear friend and psychiatrist, she struggled to understand what was causing these spells. However, before she could learn anything, she became a person of national interest when she shared a rather out of this world equation with a certain scientist, making her the number one wanted person by the government and others with less patriotic intentions. 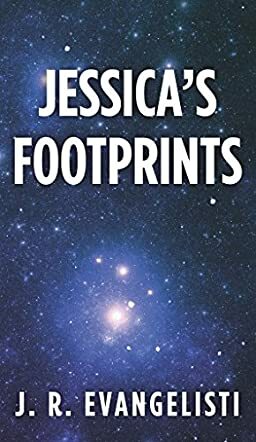 Jessica’s Footprints by J.R. Evangelisti is a very intriguing story with a perfect mix of science fiction and suspense to keep you glued to the pages until the very last word. The story is based on a unique and captivating plot with out of this world and yet believable theories. I enjoyed the way the people interested in Jessica's work were of two great extremes - those who completely believed in it and those who completely disagreed with her theories; each side strongly believing that they had the truth. The tension and suspense kept me reading non-stop so I could get to the end and understand how the story played out. But when I got there, I was not at all prepared for the twist; the ending was unlike any I could have imagined; it was absolutely mind boggling. This is the best book i've ever read! Stone Thread is also a great book by him!